Starting from in situ studies, we develop an information-processing theory of biologically inspired design. We compare our theory with two popular theories of biologically inspired design: Biomimicry 3.8 Institute’s Design Spiral and Vincent et al.’s BioTRIZ. While Design Spiral and BioTRIZ are normative and prescriptive, our information-processing theory provides a descriptive and explanatory account of the design paradigm. 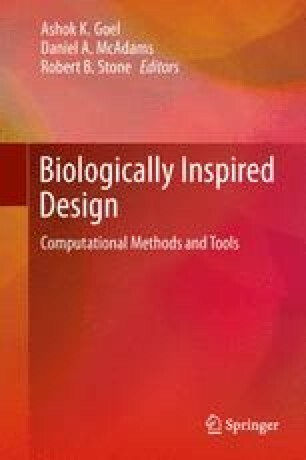 We examine if and how the process of biologically inspired design is different from that of other design paradigms beyond the differences between biological and technological systems. We posit that biologically inspired design appears to be a distinct design paradigm in part because it entails solution-based analogies in addition to the problem-driven analogies typical of other design paradigms. We are grateful to the instructors and students of the ME/ISyE/MSE/BME/BIOL 4740 class from 2006 through 2010, especially Professors Jeannette Yen, Craig Tovey, and Marc Weissburg, as well as the design team that developed the Shark Attack and Levee projects. We thank the US National Science Foundation for its support of this research through a CreativeIT Grant (#0855916) titled “Computational Tools for Enhancing Creativity in Biologically Inspired Engineering Design,” and a TUES Grant (#1022778) titled “Biologically Inspired Design: A Novel Biology-Engineering Curriculum.” This chapter augments and amplifies the information-processing analysis of biologically inspired design developed in Vattam et al. 2010b and Goel et al. 2011b. Figures 6.1 through 6.7 and Figure 6.9 have been adapted from Goel et al. 2011b. We thank the reviewers of the earlier papers and this chapter for their critiques.